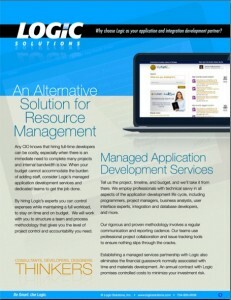 FOR IMMEDIATE RELEASE—March 13, 2013—ANN ARBOR, MI—Logic Solutions has added managed application development services to better address client resource management needs. Logic is a work-for-hire application development firm, specializing in web and mobile application development. Historically Logic has offered services on a time and materials project basis, and by implementing dedicated development teams for customers. By adding a managed application development service offering, Logic provides companies the opportunity to transfer project management responsibilities as well as development work. Logic’s managed application development engagements also differ from dedicated team services in that a host of predefined tasks are performed over a fixed period with recurring, predictable costs. Because Logic manages workflow and delivery, this type of relationship minimizes productivity risk for clients. Logic employs professionals with technical savvy in all aspects of the application development life cycle, including business analysts, consultants, user interface experts, project managers, programmers, graphic designers, integration and database developers, quality control engineers, and more. The firm’s rigorous and proven methodology involves a regular communication and reporting cadence, as well as the use of project collaboration and issue tracking tools. Founded in 1995, Logic Solutions, Inc. is a privately held minority-owned corporation specializing in application development for web and mobile. Logic also offers the Showcase™ mobile sales system on iPad. The firm is headquartered in Ann Arbor, MI, with locations around the globe. More information is available at https://www.logicsolutions.com. © Copyright Logic Solutions, Inc.